This has been a busy and beautiful day up here on the high plains. The temperature got above 60 (maybe even 70) and with blue skies and scudding clouds, perhaps “rain with thunder” tonight. Not quite a thunderstorm, but deceptively dangerous! Particularly if you are afraid of lightening — which I am. It is a fear born of close calls. I have no reason to court danger. At the first rumble, late this afternoon, I came indoors. At which point, one of my neighbors, an HOA Board member, drives by and stops, roles down her window and says, “A Bobcat? Really?” We share a laugh, and I tell her what is going on. In the meantime my son gets the Bobcat parked in our driveway. We always like to provide the neighborhood with a little something to talk about. With the Bobcat unloaded, he and I got into the truck for the drive to Larkspur to get the boulders. And that’s when the left front tire on the trailer began squealing and smoking. We pulled over. My son contact the rental company. They asked questions and had him try a few things. We started off again. The first time he used the brakes, the wheel locked up again. We both knew we weren’t driving that trailer anywhere but back home, where he called the rental company again and they sent a replacement trailer out. Thirty minutes later, we were on our way for a nice drive down to Larkspur on a beautiful day. Our boulders were set to the side, and the folks loaded them up and we secured them with the chains that had secured the Bobcat earlier. Then we headed home, stopping every little bit to check the chains and make sure they hadn’t gone slack. One of our boulders broke a bit on the trip and then broke into many bits when he tried to unload it. It had some fractures in it to begin with, and the bouncing down the road did it in. We got all the pieces unloaded and the two remaining boulders. My son drove that Bobcat like he knew what he was doing! I had him put one near my sunset watching chair so I could have company if I wanted or set a drink on it if I don’t. Or both. The other he struggled to stand on end for me, because that was the way I wanted it. It took many unsuccessful tries. Many. And we are propping it, for now, while it settles into place — but by golly he got it upright and facing the way I wanted it. Could a mother ask for more? 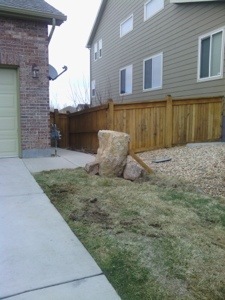 He grouped three of the bigger pieces off of the broken boulder near the end of the driveway, where delivery trucks like to run over my lawn. It will mean that I will have to be more careful, too! 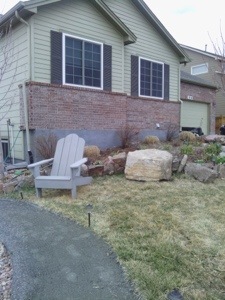 We’ll use the rest of the broken pieces to extend our little rock wall around the garden to the fence and add some interest to the xeriscape on the side. 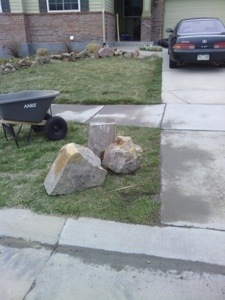 Then, while he got ready for an evening of Denver Center theater, I power-washed the Bobcat tracks off the driveway and sidewalk, before I took a few pictures of the results of all that hard work. And then I just stood back and admired it all. This story brought back memories when we landscaped with boulders a long time ago. Thanks for sharing your day. The boulders look great! I love rock gardens too.